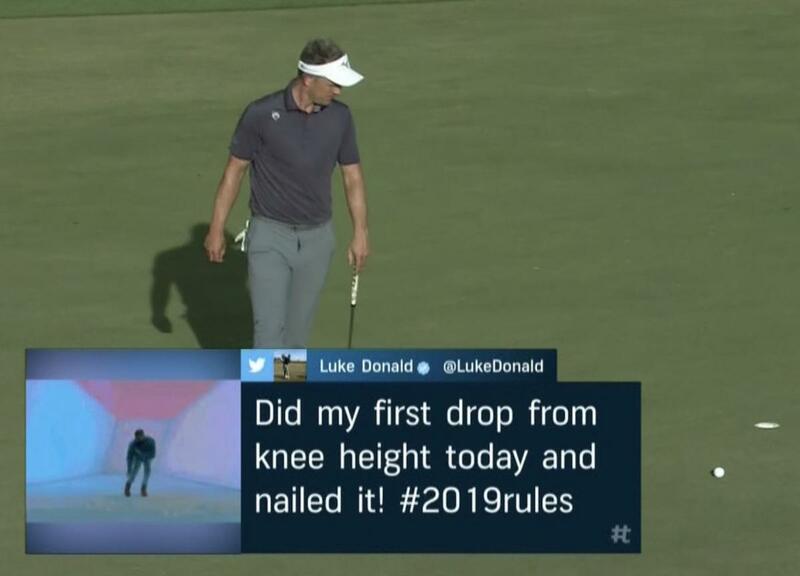 We've known that professional golfers are often not the most knowledgeable of the Rules, and so this Twitter conversation shouldn't surprise anyone. This topic exists to share stories of pro golfers and the 2019 Rules. That means we might find ourselves discussing a pro golfer screwing something up, talking about the Rules changes, doing something under the 2018 Rules accidentally, whatever. I'll pin the topic for now, as I expect the beginning of the year might see a flurry of activity, while I also suspect it will die down by about March or April. 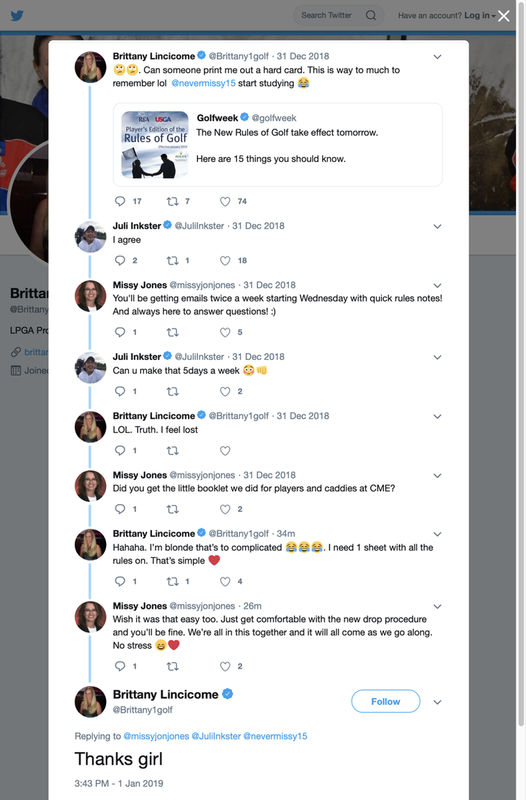 BTW I recommended to Brittany that she check out RulesGeeks.com. You should as well. I asked Dave, and he said he was always 95% on the rules, which placed him way, way above the vast majority of his peers. On a different note, I watched the play at Kapalua for a few minutes on Thursday, and say my first example of a pro tapping in without removing the flagstick. I don't even recall who it was that did it (might have been DeChambeau, I saw him on a couple of shots), but I have to say that despite knowing the new rule, it still looked odd. I like DeChambeau's comments about it. He has apparently been running his own tests, and he agrees with Erik that leaving the stick in the hole is advantageous. I'll certainly be leaving it in on most of those 3-5 foot knee-knockers where I'd rather have the option of being a bit more aggressive. Dustin Johnson shares what happened on the fourth hole during his second round where he was penalized for playing the wrong ball. Webb Simpson benefited from the new Rules of Golf Saturday at Kapalua after he stepped on his golf ball. Other possible reasons could involve fatigue, pressure late in the round, the grass growing and/or being in the sun and/or just becoming less "mowed/rolled" throughout the day could have an effect too. But to the other side of things, players further into the round should have a better idea of how the greens are rolling, too. As far as the fatigue issue...if this was compared to other stats in areas that require much more exertion (driving, approach shots) then maybe we’d see a trend. But that’s difficult as those shots could be affected by weather and course set up more so than with putting. But I think it’s an interesting stat that he’s made. Spieth, although he talked about the rule and from what he said, knew it, still dropped from the shoulder before corrected. Woods nearly jarred his tee shot on the par-3 11th hole, setting up what appeared to be an easy birdie attempt from inside of 3 feet. But as he stood over the ball to take his address, it moved slightly, and caused him to back off and summon a rules official. 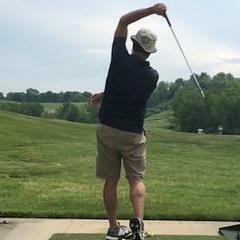 While Woods did not cause the ball to move, under the new rules he was required to return the ball to its original position and continue on without penalty. I can see the LPGA crying foul here!